Figaro offers a wide range of gas sensor products for the detection of various gases, from explosive gases such as propane, toxic gases such as carbon monoxide, to air quality sensors for volatile organic compounds (VOCs) that are responsible for sick-house syndrome. Figaro offers a diverse portfolio of sensor technologies that can be matched to the unique requirements of each application. Figaro Electrochemical-type gas sensor are amperometric fuel cells with two electrodes. The basic components of two electrode gas sensors are a working (sensing) electrode, a counter electrode, and an ion conductor in between them. When toxic gas such as carbon monoxide (CO) comes in contact with the working electrode, oxidation of CO gas will occur on the working electrode through chemical reaction with water molecules in the air (see Equation 1). Connecting the working electrode and the counter electrode through a short circuit will allow protons (H+) generated on the working electrode to flow toward the counter electrode through the ion conductor. In addition, generated electrons move to the counter electrode through the external wiring. A reaction with oxygen in the air will occur on the counter electrode (see Equation 2). The overall reaction is shown in Equation 3. Figaro Electrochemical-type gas sensor operate like a battery with gas being the active material for this overall battery reaction. By measuring the current between the working electrode and the counter electrode, this electrochemical cell can be utilized as a gas sensor. In order to measure the sensor’s output current, it must be connected to an external circuit. By controlling gas flowing toward the working electrode with diffusion film, output current flowing across the external circuit will be proportional to gas concentration (see Equation 4 and the chart at the right). The linear relationship of gas concentration to sensor output makes this technology ideal for gas sensing applications. 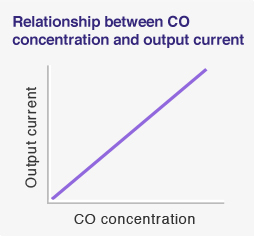 The oxidation potential of CO gas (as expressed in Equation 1) is lower than the oxidation potential of the electrode（2H+ + 2e- ⇔ H2), i.e. oxidation of CO has less noble potential than deoxidization. Since this reaction occurs easily, no external energy is needed to stimulate the sensor’s chemical reaction, unlike with three-electrode type sensors. As a result, this two-electrode type sensor offers superior characteristics for interference resistance, repeatability, and power consumption. Carefully read product information and other technical information provided by Figaro before using our products, and confirm specifications and operating conditions. When designing an application circuit, please make sure that an accidental short circuit or open circuit of other electronic components would not cause excessive voltage, current or temperature exceeding rated values to be applied to the gas sensor. When designing application products, please make sure that a gas sensor malfunction would not 1) cause adverse effects on other components, 2) directly or indirectly impair the safety of application products using gas sensors (e.g., malfunction, emitting smoke, fire, or any other unstable state of application products). Consider adding safety measures for fail-safe where necessary, such as a protection circuit. Do not use the gas sensor if higher than the rated voltage is applied. If higher than the rated voltage is applied to the sensor, breakage may occur, or sensor characteristics may be irreversibly impaired even if no physical damage or apparent breakage is noticeable. Do not use the sensor under higher temperature than the rated conditions. If the gas sensor is exposed to higher than rated temperature, the sensing membrane may deteriorate, resulting in an irreversible change of sensor characteristics. ・Avoid contamination by alkaline metals. Sensor characteristics may be significantly changed if the sensor is contaminated by alkaline metals, especially salt water spray. ・Sensor characteristics may be irreversibly changed by exposure to high concentrations of base gases such as ammonia. Please consult with Figaro for additional information. ・Avoid exposure of sensor where adhesives or hair grooming materials containing silicone, or silicone rubber/putty may be present. Silicone vapors may cause clogging of the gas diffusion route. ・If severe dew condensation occurs for a long period inside the sensor or on the sensor’s surface, it may cause clogging of the gas diffusion route or deterioration of the sensing membrane. Mild dew condensation which occurs in normal indoor air would not cause any problem. ・If the sensor is exposed to hydrogen sulfide or sulfuric acid gas, sensor components such as the gas diffusion film, can, and cap may be corroded, resulting in sensor damage. ・If the sensor is exposed to organic vapors such as alcohols, acetone, or volatile oils, these gases may adsorb on the gas sensing layer, resulting in temporary but reversible sensor drift. ・Extremely high concentrations of dust or oil mist may cause clogging of the sensor's internal structure. When such conditions are expected to be encountered, installation of an external filter is recommended. ・If freezing of the water in the reservoir were to occur very rapidly (i.e. as would happen only under artificial conditions), water leakage may occur inside the sensor, irreversibly changing its characteristics. This risk greatly increases if the sensor is positioned with the cap (working electrode) facing down. Do not keep the sensor in a completely sealed container such as a sealed bag. Due to ambient temperature change, dew condensation may occur inside the sensor if the sensor is stored in this manner. ・Sensor characteristics may be changed due to soaking or splashing the sensor with water. ・Vibration and mechanical shock may cause an open or short circuit inside the sensor. ・Under no circumstances should the sensor be disassembled, nor should the sensor can and/or cap be deformed. Such action would void the sensor warranty and would cause irreversible change in characteristics. When subjected to temperatures below 0˚C, it is possible that the water in the reservoir may freeze. Since water volume will expand when freezing, the sensor can may undergo some deformation. Care should be taken in the design of the detector to ensure that the sensor is not placed too close to other components or the circuit pattern on a printed circuit board, as such deformation may cause the sensor to come in contact with these items. ・Manual soldering is recommended since high concentrations of flux may affect sensor characteristics when the sensor is wave soldered. When wave soldering is used, a test should be conducted before production starts to see if there would be any influence to sensor characteristics. ・When a resin coating is applied on a printed circuit board for improved resistance to moisture and corrosive gases, the chemical solvent contained in coating material may affect sensor characteristics. Sample testing should be conducted to see if this process would adversely affect sensor characteristics.